VAIL – Twenty new lift towers installed Thursday morning at Vail Mountain are the first signs of shorter lift lines out of Vail’s Sun Up and Sun Down bowls this winter. The construction for Vail’s new Chair 5, also known as the High Noon Express Lift, has been under way since the spring, when Vail Mountain removed the old chairlift and sent it to Nelson, British Columbia, where it’s being installed at the Whitewater Ski Resort. The new lift will be a huge addition for Vail Mountain, said Vail Resorts chief executive officer Rob Katz during the company’s fiscal 2010 earnings call Thursday morning. He said the new Chair 5 is cutting the ride time out of Vail’s Sun Up and Sun Down bowls in half, from 12 minutes down to 6 minutes. “The new Chair 5 will allow skiers and riders to better enjoy Vail’s Back Bowls,” Katz said. The new Chair 5 will be open this coming winter season, premiering as soon as snow permits the opening of Vail’s Back Bowls, Vail Mountain spokeswoman Liz Biebl said. Two teams of four helped get the base towers installed Thursday as a helicopter dropped each of the 20 towers in pieces to the 20 base sites, Biebl said. The helicopter, which carries as much as 4,200 pounds per load, was also used to pour the concrete for the base towers about a month ago. 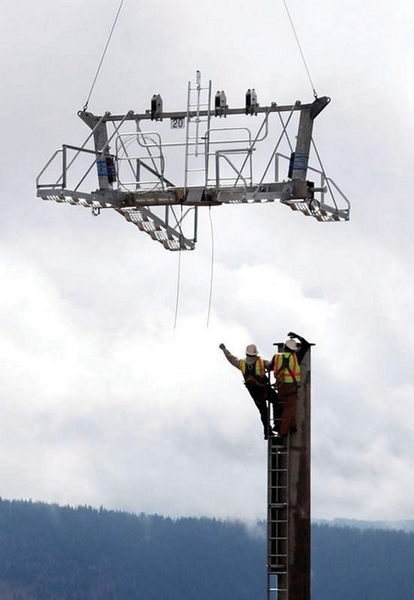 The new lift is part of $75 million to $85 million in capital improvements at the company’s resorts this summer. The continued investments during an uncertain economy distinguish Vail Resorts as a leader in the mountain resort industry, Katz said. The old Chair 5, built in 1979, was a fixed-grip, three-seater – a slower lift that often resulted in long lines on weekends or powder days. The new Chair 5, a high-speed quad, will be able to carry 2,400 people per hour – 1,000 more people per hour than the old lift could handle.